Updated December 19, 2010: Streetcar service resumed today on Roncesvalles Avenue to Dundas West Station. The construction is not yet finished and this has predictably upset the neighbourhood. The TTC seemed unusually ineptly prepared for this changeover. Electric switches at many locations had not been reactivated requiring operators to throw points at commonly used junctions by hand. The Sunday Stops on Roncesvalles which were not supposed to be part of the new design remain in place both at stop poles and in onboard stop announcements. Indeed, the location of some stops appears to be a leftover from the shuttle bus operation. At least one errant auto, parked in the wrong direction and foul of the southbound track, was struck by a passing streetcar. Permanent signs indicating where people can and cannot park don’t exist yet, although a number of temporary “emergency, no parking” signs have appeared. Anyone interested in watching service reliability can do so via various monitoring sites. Meanwhile, Parliament Street reopened to regular traffic recently, and this morning, both the King and Dundas cars diverted bothways via Gerrard and Parliament to bypass construction on Broadview. No pointman was provided for the westbound manual switch at Parliament, although on previous occasions the TTC has spent a small fortune manning this location for diversions. Why the switch isn’t electrified is a mystery considering how frequently this diversion is used. Updated October 29, 2010: Construction proceeds apace on Roncesvalles north from the carhouse on the west side of the street. New sidewalks have been laid to roughly High Park Avenue, and the new stop layouts with “bumpouts” of the sidewalks are taking shape. The City of Toronto has an updated Construction Notice with more details on the work staging. 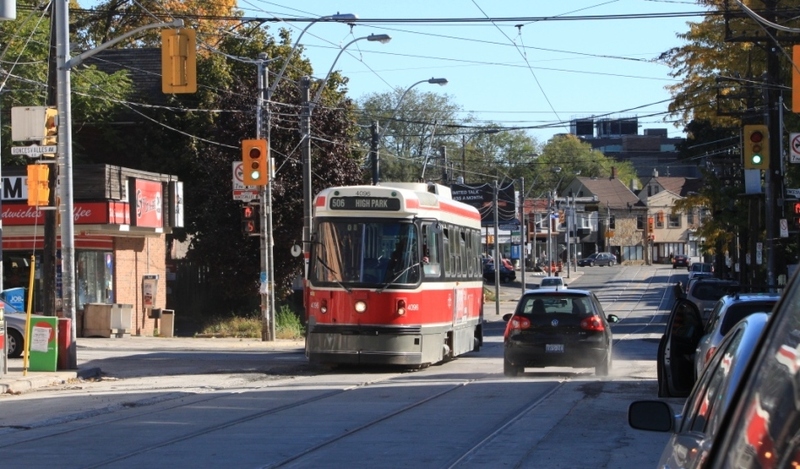 The TTC schedules taking effect on December 19, 2010, include restoration of streetcar service on Roncesvalles. Preliminary work on overhead installation is already in progress. This photo, taken on October 27, shows the stop southbound at Wright. You can see where the old curb line was from the location of the hydro pole. The space between the edge of the concrete and the track will hold the shared cycling/pedestrian space (see photo below). This photo shows the southbound stop at Garden Avenue. The area where new concrete is being poured will be a shared space for cycling and pedestrians (note the ramp down to street level at the end of the loading area). The concrete is at a lower level than the adjacent sidewalk in preparation for a surface layer of pavers which will have a different look and texture to set this off from the pedestrian-only area. 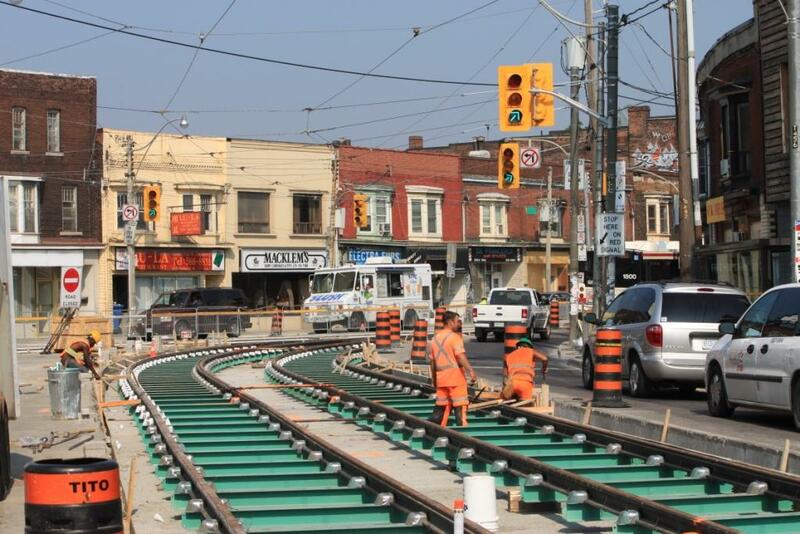 Meanwhile on Parliament Street, the track construction is almost completed with only surface layers of concrete still to be placed just south of Gerrard. The street has not fully reopened because of utility and paving work in the west curb lane. Updated October 9, 2010: Today service on the 506 Carlton route returned to High Park Loop, and the 504 King route resumed operation via King between Church and the Don Bridge. Entering a somewhat overgrown High Park Loop. This area was not part of the project, but I couldn’t resist including this view of the streetcar coming through the bushes. Looking south on Roncesvalles from Howard Park. The north to east switch is visible at the lower left of the photo. Concrete work stopped just short of the intersection as welding is not yet completed. 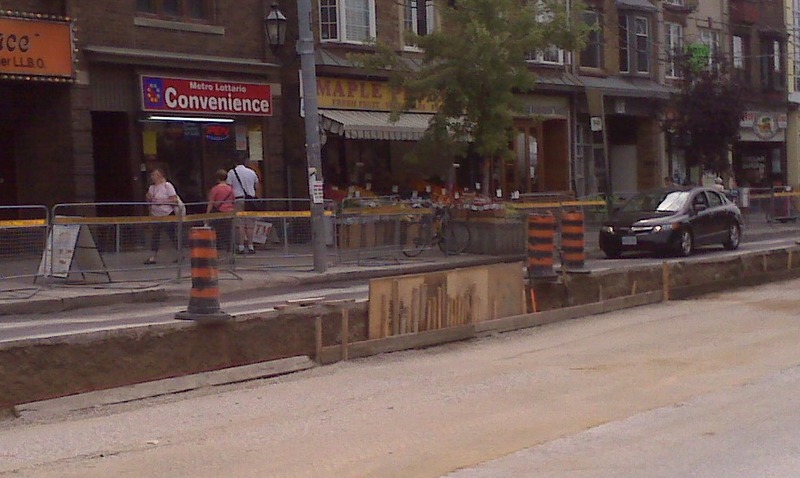 Work on the west sidewalk on Roncesvalles is proceeding slowly north from Queen. Unlike some other projects (such as Parliament Street) the road grade is also changing here, and the curb lanes must be rebuilt to bring everything into line with the new car tracks. 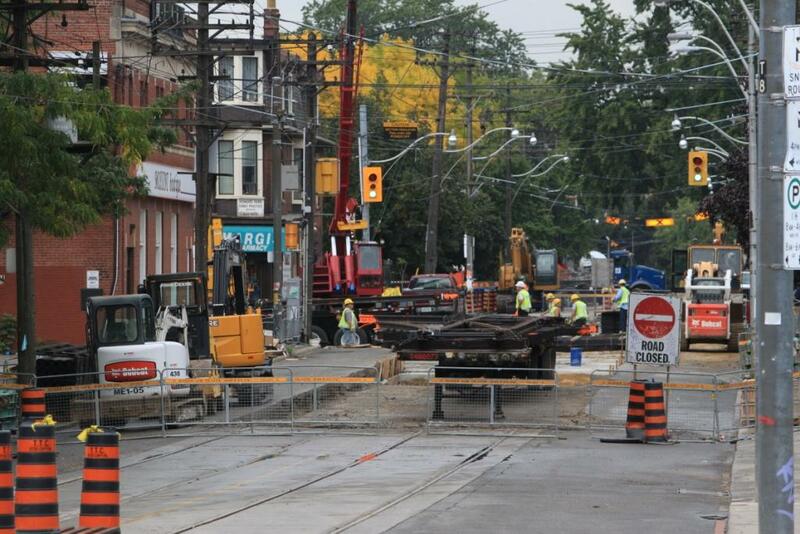 There is no sign of any work beginning on King east of Roncesvalles. I am trying to get confirmation of whether this has been deferred to 2011 so that construction can concentrate on Roncesvalles itself. 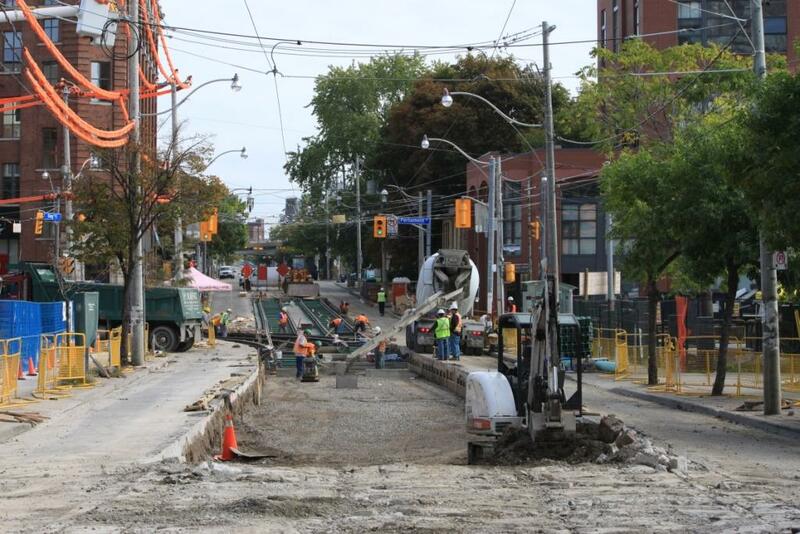 Updated September 22, 2010: Work at Howard Park and Roncesvalles is now underway. Because this project completely occupies the intersection and nearby streets, there is no attempt to operate transit service on either street, and everything diverts elsewhere. The west-to-north curve, a last remnant of track serving Dundas Carhouse, will not be replaced, and this will leave the two curves in the south-east quadrant as access to Roncesvalles Carhouse for Dundas and Carlton cars. Once the intersection is finished, the track south from Howard Park to Grenadier can be added. This section was left as a construction staging area for the intersection project. 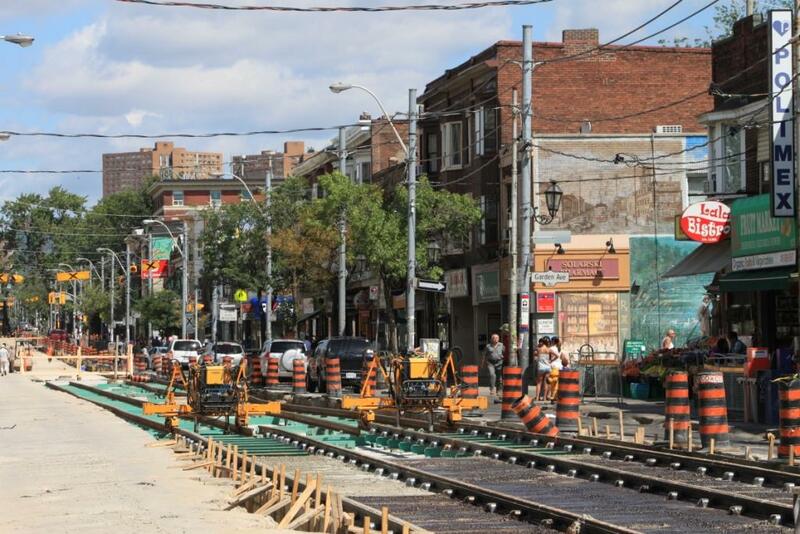 Trackwork will move to King between Roncesvalles and Close in mid-October. Looking west on Howard Park to Roncesvalles. The track panel on the trailer is the west-to-south facing switch. These photos were taken on September 22. … the track in mid air suspended to the two rail handlers. These machines are able to “walk” and deal with various elevations of the roadbed as shown here. With the track in exactly the right location, they will lower the panel onto the concrete roadbed. A side view of the equipment used to manœuvre the track panels. Meanwhile, at King and Parliament, the intersection replacement began just after Labour Day. The work also includes King Street itself to a point west of Berkeley. This will repair curves that were not welded when they were installed in the previous iteration of trackwork at this location. The photos below were taken on September 18. Looking west on King across Parliament from the north side. Looking west on King from the south side. The excavation work behind the blue fence is unrelated work on a new condo side. Looking east on King from Berkeley. Work at the north end of the Parliament project is largely completed to Dundas Street. The section from Dundas to Gerrard (not including either intersection) will follow soon. Updated September 1, 2010: Work at Roncesvalles & Dundas has progressed to the point that the new special work is installed and most of the concrete work around the switches is complete. 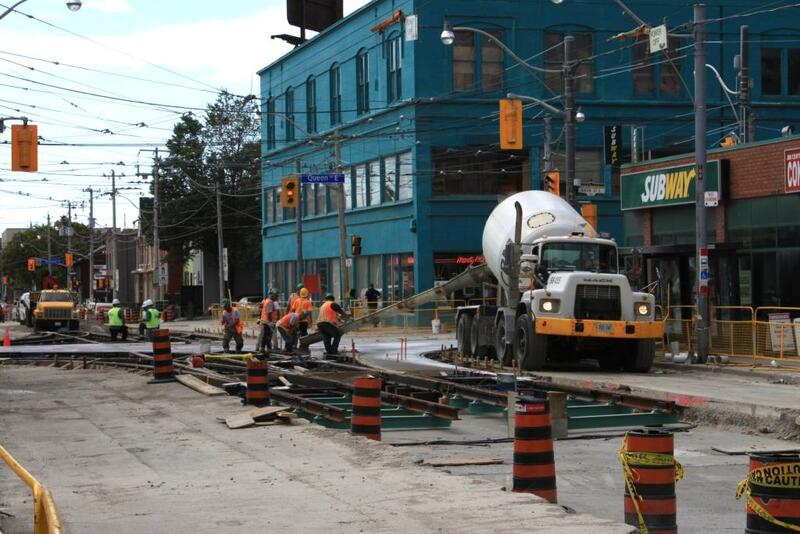 Work on tangent rail south and east from the intersection focuses on Dundas Street so that streetcar service can resume on September 7. 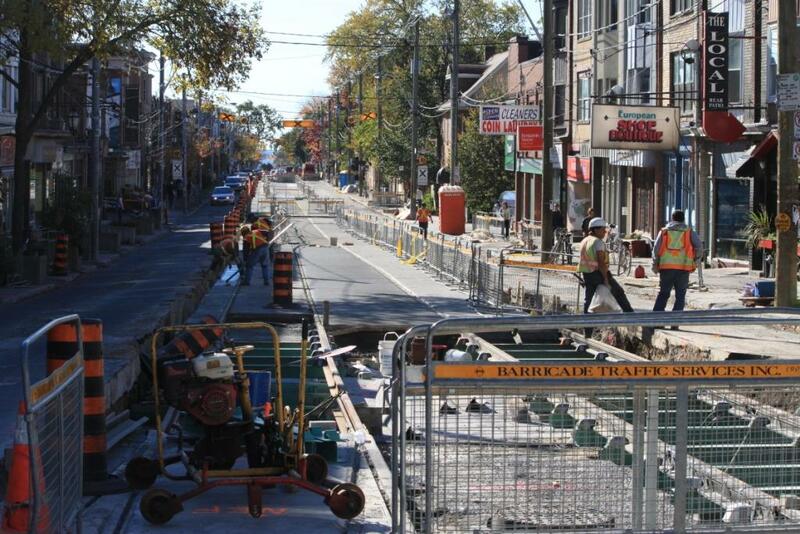 On Roncesvalles, the excavation and track installation continues south toward Howard Park. Construction south of Howard Park has reached Constance Ave., two blocks away from the junction with the 506 Carlton route, and track is in place to Grenadier. At this rate, all track will be finished north and south of the intersection by mid-September. No date for the intersection reconstruction has been announced yet. Looking south on Roncesvalles at Dundas. Looking northwest on Dundas to Roncesvalles. Severe traffic congestion and transit delays occur eastbound on Howard Park because the traffic signals have not been re-timed to reflect this street’s temporary role as a major route through the area. In particular, only a small amount of time is available for left turns east to north at Dundas even though the normal through flow on Dundas is cut off by the construction. This is an example of a lack of attention to details in the management of construction diversions that makes the effect worse than might otherwise occur. 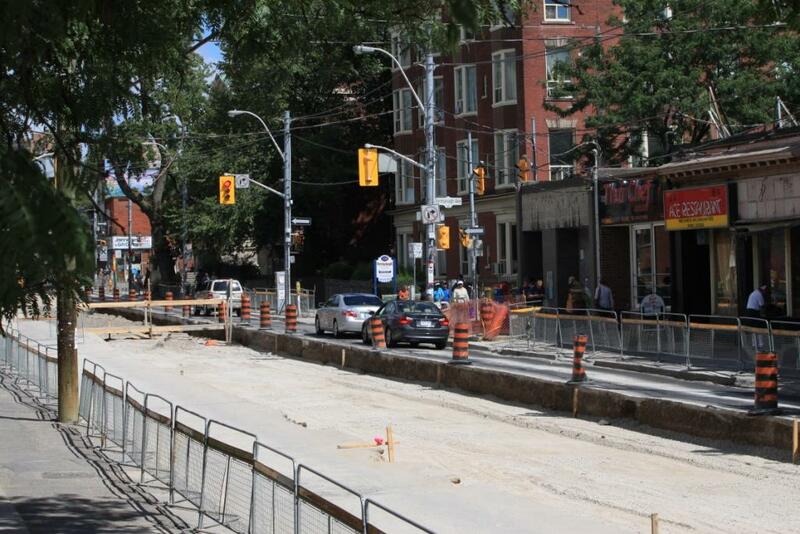 Meanwhile on Parliament Street, track construction occupies the stretch from Shuter north to Dundas Street. This will continue to September 3, and work will then shift to the King & Parliament area. Parliament will be completed south to King Street over the Labour Day weekend, and in following weeks, King (including the special work at Parliament) will be rebuilt from Power (east of Parliament) to Berkeley (the curve west of Parliament). 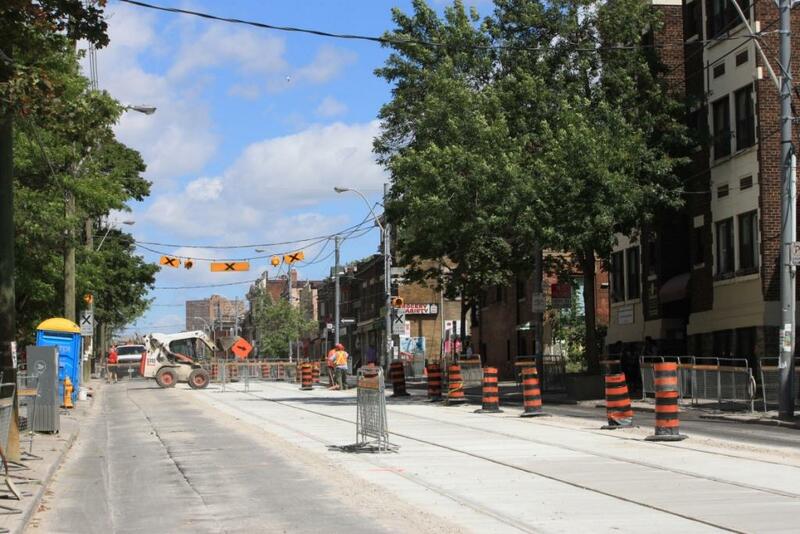 Streetcar service on King will divert bothways via Church and Queen. The TTC’s website contains two pages detailing this project, one on their “Construction” sub-site, and one under “Diversions”. This is an example of a structural problem with the site where overlapping and conflicting information appears under two separate branches. Updated August 23, 2010: Work starts today on reconstruction of the section of Roncesvalles south from Dundas to Howard Park. 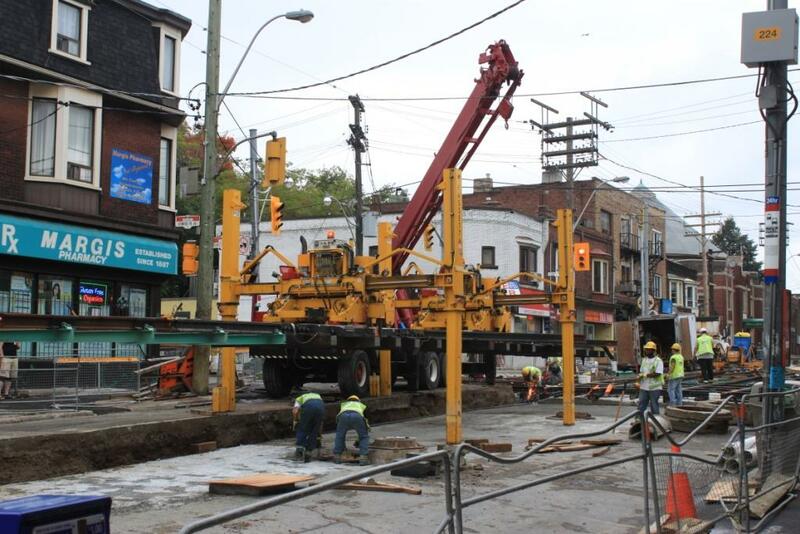 Work begins at the Dundas & Roncesvalles intersection and will close both streetcar lanes and the southbound traffic lane. By August 30, the southbound lane will re-open, but traffic will be unable to cross the streetcar tracks to turn east on Dundas. On September 7, the intersection work will be completed and Dundas Street will re-open. The 505 Dundas and 306 Carlton Night services will divert to High Park Loop. The 504 King shuttle bus now has a meandering route diverting from Dundas and Bloor west to Parkside, south to Howard Park and east to Dundas (thence via its “regular” diversion down Lansdowne). Northbound, the buses will turn east on Howard Park from Roncesvalles to Dundas, then northwest to Dundas West Station. A separate 505 Dundas shuttle bus will operate between Dundas West and Lansdowne over the same diversion routing southbound as the 504 King shuttle. The 313 Jane Night service will follow the same routing as the 504 King Shuttle bus and will loop at Sunnyside Loop. During track construction on Roncesvalles north of Howard Park, only the northbound road lane will remain open using the same configuration as with the work south of Howard Park. 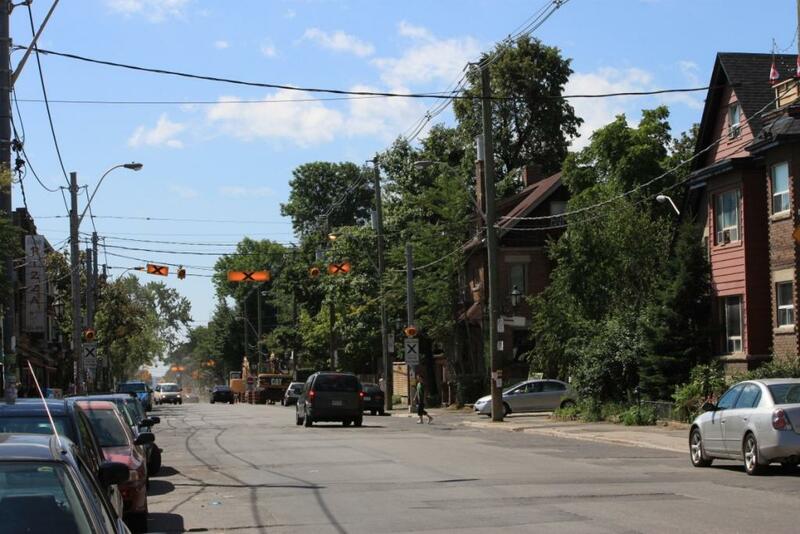 No date has been announced yet for the reconstruction of the Howard Park & Roncesvalles intersection. 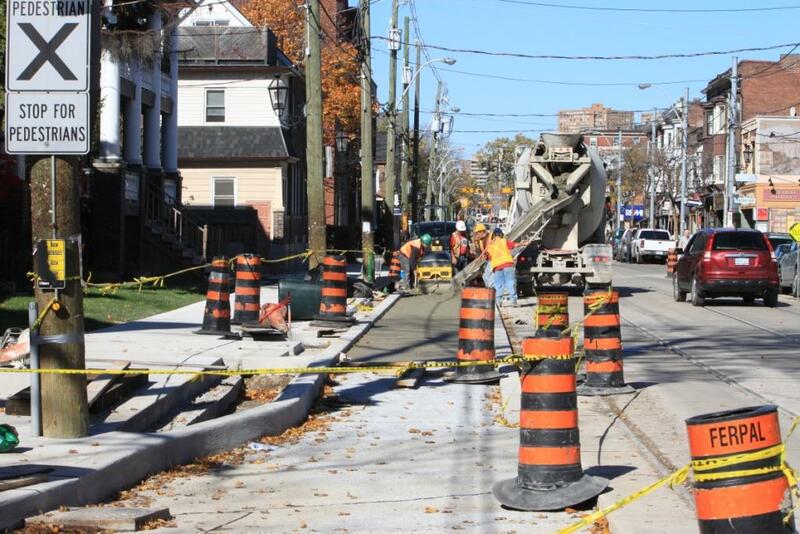 Meanwhile, sidewalk and curb lane reconstruction has started on the west side of Roncesvalles north from Queen. Work will begin at a later date on the east side. Updated August 9, 2010: This morning, Roncesvalles was closed northbound at Fermanagh due to partial collapse of the roadway. Buses were unable to use the street until this was shored up. The concrete under the road surface is particularly thin at this location, and the soil underneath is sand. Service resumed about 10:50 am. Updated August 7, 2010: Photos of Roncesvalles Avenue showing various stages of track construction have been added at the end of this article. 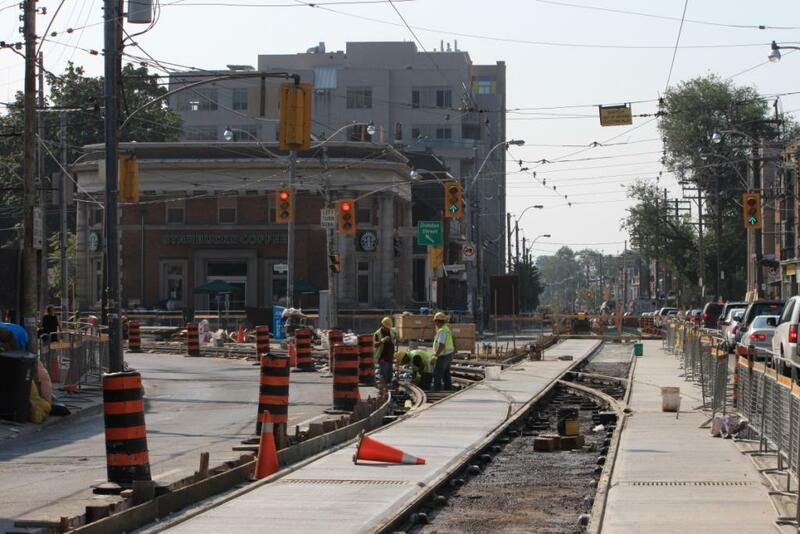 Also added are photos of the reconstruction of the intersection at Queen & Parliament. 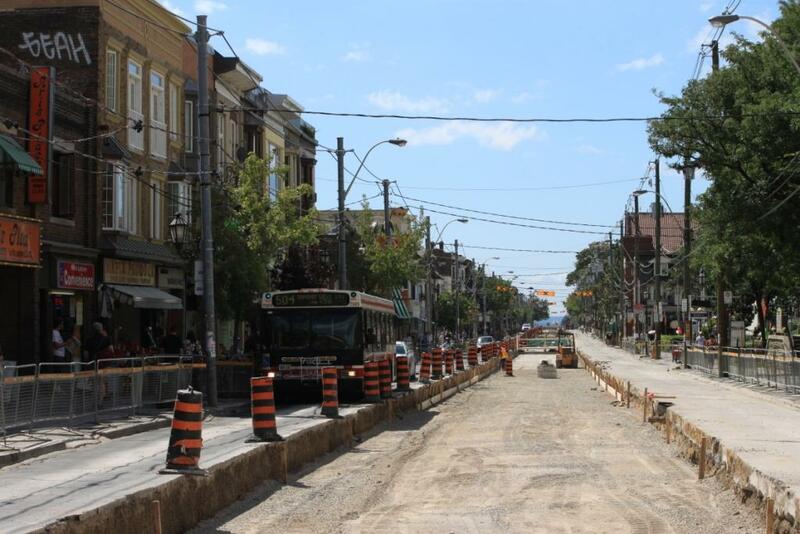 Updated July 25, 2010: Construction is proceeding quickly north on Roncesvalles from Marion. It appears that for this project, track assembly will follow soon behind pouring of the foundation slab in the road. This allows the foundation to cure even while track is put together, but not yet set in pavement. Finishing the centre lanes is important so that traffic can shift to them allowing reconstruction and reconfiguration of curb lanes and sidewalks. The new overhead poles will be installed as part of the sidewalk work because their location will change to suit the new street layout. Details including route diversions are on the project web page. The work is expected to end in December. 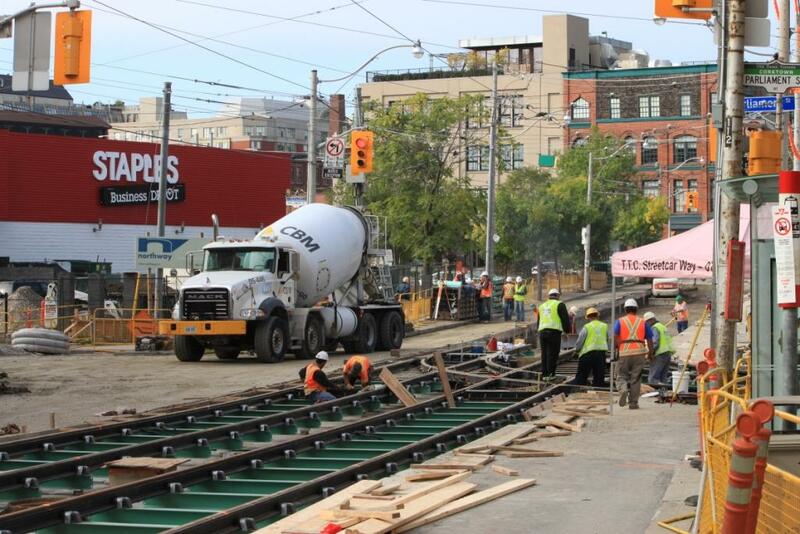 Construction of new track on Roncesvalles is planned to start north of the carhouse exit on Monday, July 12. This will be built to the “new Roncesvalles” design including sidewalk bump-outs at stops to permit direct boarding of streetcars from the curb. The work is expected to take until November. The King shuttle bus will divert southbound via Dundas and Lansdowne to Queen, then operate west to Sunnyside Loop, and east via King to its terminus at Shaw Street. Westbound/northbound service will run via Roncesvalles where the east curb lane will be kept open for traffic. 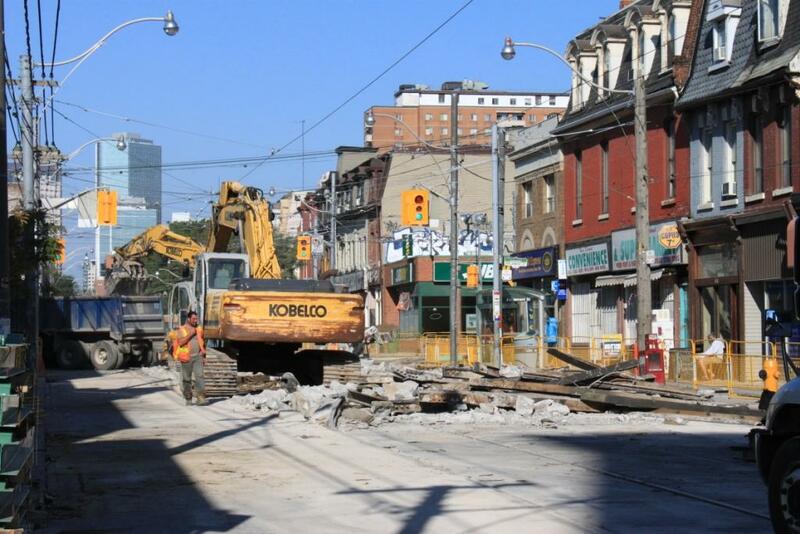 No date has been announced yet for track replacement on King between Roncesvalles and Close. Watermain replacement is now in progress in this part of the street, and the south curb lane east of Roncesvalles is used for track storage. 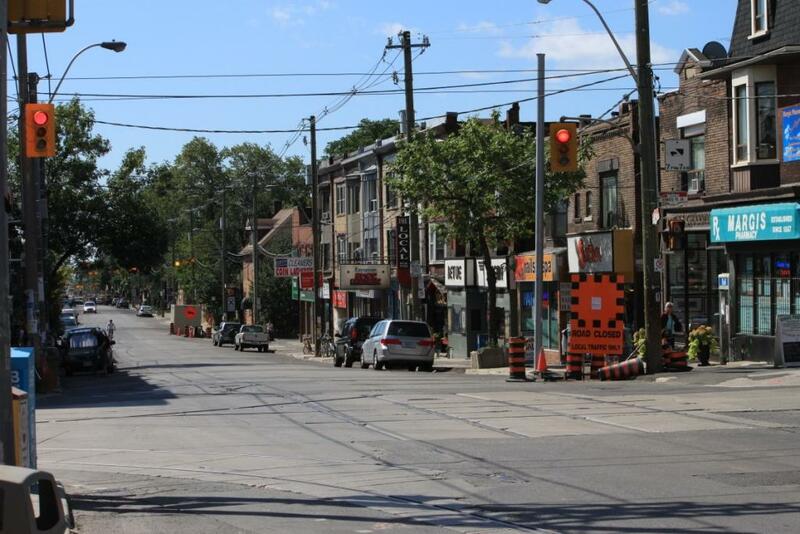 The construction on Roncesvalles has proceded very quickly northward, and I hope that this will become an example of the TTC and City doing a project quickly and with minimum disruption (allowing for the fact that the entire road and sidewalks are being replaced). We have heard far too much about St. Clair, and it’s time we saw a counter-example. 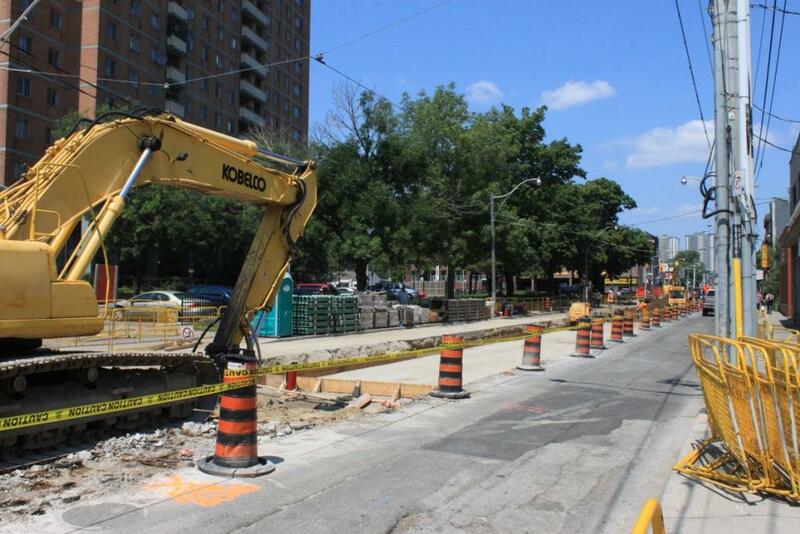 Work began northward from Harvard Ave. (two blocks north of Queen Street) on July 12. 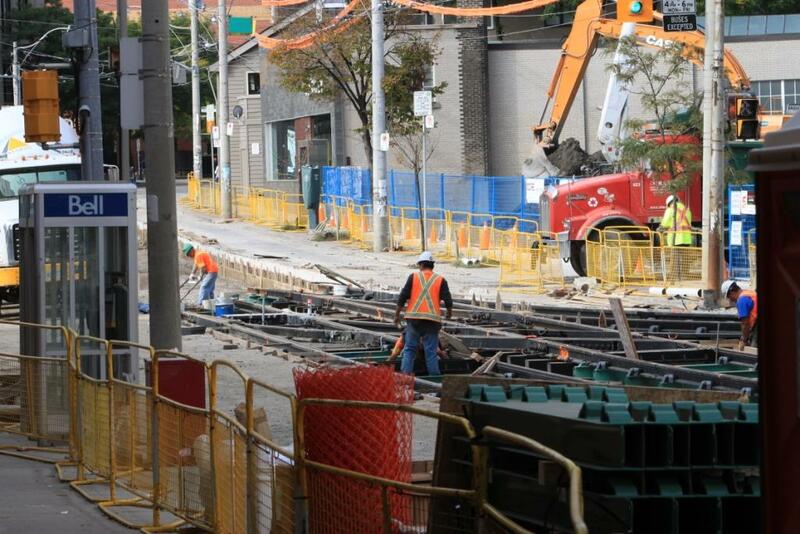 Three weeks later, the excavation is not quite half way to Dundas Street, and track installation is well underway. Looking south across Howard Park Avenue, we can see the remnants of the intersection with the 506 Carlton route which continues to operate to High Park Loop. This intersection will be rebuilt, including the west-to-north curve (the survey marks for it are in place already), one of the few remnants of Dundas Carhouse. Looking south at Grenadier Road. The rather uneven condition of the pavement is left over from the watermain work done in 2009 which required removal of the streetcar tracks. Looking north at Westminster Avenue. This is the north end of the excavation as of August 7, 2010. Note the depth of the excavation. As you will see in photos below, a completely new track foundation will be constructed, quite likely much better than what was removed. Looking south from High Park Boulevard / Fermanagh Avenue. The 504 King shuttle buses must pick their way carefully between the construction pylons, the excavation, the hydro poles and the existing sidewalk. This is not a high-speed operation. Meanwhile, this stretch of the excavation shows the base in various stages of being packed down and levelled in preparation for the concrete slab. This view looks north to Fermanagh (the previous shot was taken from the pedestrian bridge visible here) again showing the depth of the excavation and the tightness of the single northbound lane. Looking south toward Garden Avenue. Here you can see track that has been laid in place but not yet assembled with ties while only a few blocks to the south, construction has progressed to laying the surface concrete slab holding the track. Looking north across Garden Avenue. This shows the second layer of concrete that goes from the base slab up to the top of the steel ties. Future trackwork will only require the removal of the top layer concrete, the one holding the rails, while the tie and foundation structure remain untouched. Also visible here in the completed track is the rubber sleeve which isolates the track from the ties and the concrete slabs to reduce vibration and to increase roadbed life. 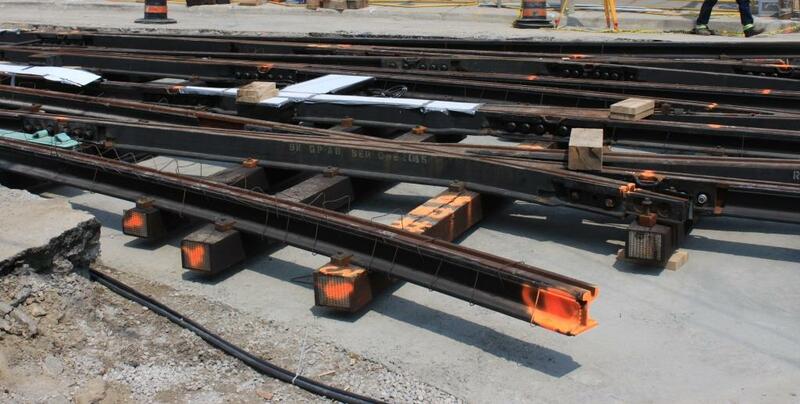 All of the joints between the rails are welded (arc welding to make the track strings visible in the previous photo, thermite welding at the joints between the strings). Looking south to Pearson Avenue. The top layer of concrete is in various stages of completion here. Looking north from Harvard Avenue. The track structure is finished here, and temporary fill is being poured into the gap between the new and the old parts of the road. Once the trackwork is complete, the curb lanes and sidewalks will be rebuilt. This will include the portion of Roncesvalles from Harvard to the North Gate of Roncesvalles Carhouse. Plans for reconfiguration of The Queensway including the roadway lane rearrangement at Roncesvalles (not the tracks) are on hold. This is a complex intersection which is 3/4 of a “grand union” having six of the possible eight curves plus the central diamonds. 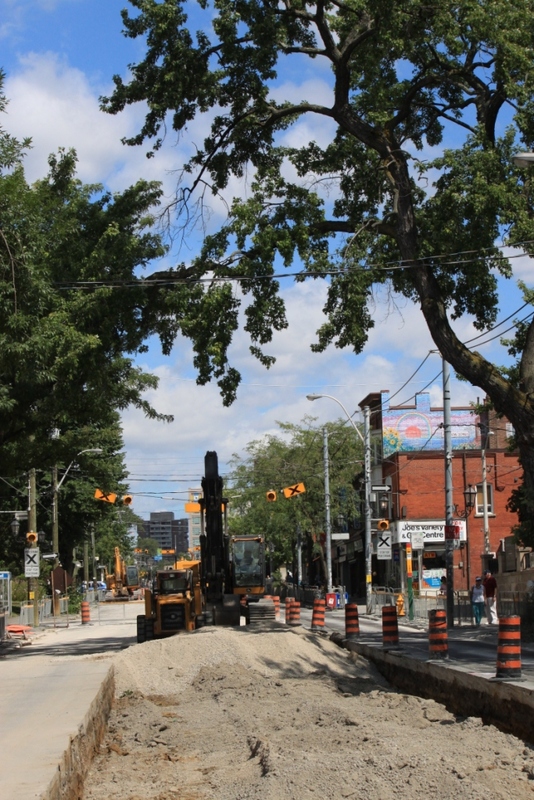 Work began on July 26 with excavation of Parliament Street south from Shuter to Queen including the special work on the north side of the intersection. Each of the eight track sections (four quadrants, two directions each) leading into the intersection was pre-assembled and delivered to the site on a trailer. 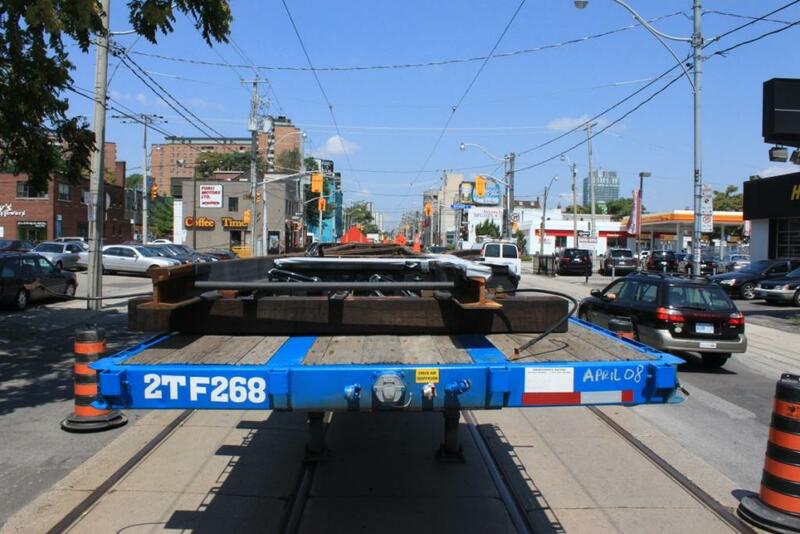 These were positioned for pickup by the TTC’s track panel moving system. This arrangement is much simpler and faster than the older scheme whereby an intersection would be completely put together in a works yard, then disassembled, trucked in pieces to the site, and then re-assembled in the street. This also allows much of the welding to be done in advance rather than during the street closure as only the joins between sections must be welded on site. The view above looks north on Parliament to Richmond. 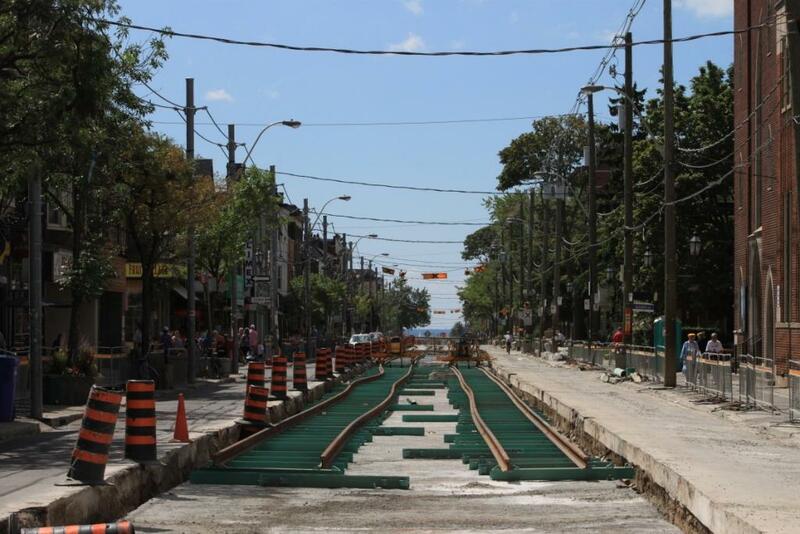 Starting on July 30, the main tracks on Queen Street were removed. 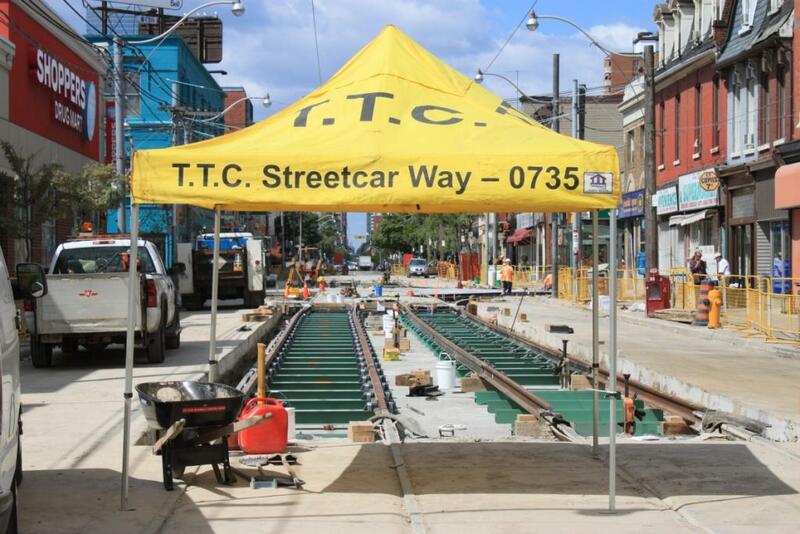 For the next two weeks, all streetcars service on Queen will divert via King and Church. This view looks west on Queen to Parliament. And, yes, power has been cut to all of the overhead wiring. By August 3, the foundation slab has been poured, and much of the intersection has been assembled in the street. This view looks to the southeast across the work-in-progress. The yellow tent on the far corner is a combination sunshade and refreshment stand for workers on the very hot days while this work was underway. 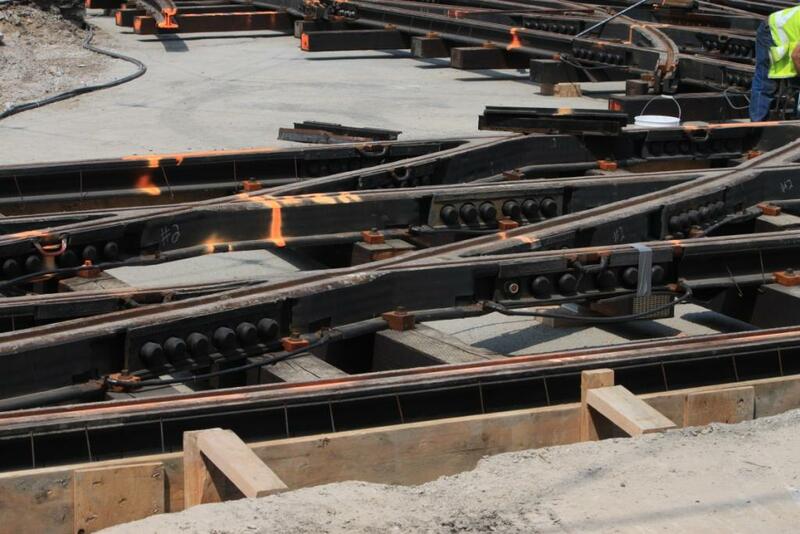 This is a closeup view of the track on the north side of the intersection. The rail with the orange paint is the south-to-west curve. Note the rubber sleeves around both the rails and specialwork castings. This isolates the intersection from the street, reduces noise from wheels crossing the diamonds, and makes the concrete last much longer. An example of this construction technique, completed in 2009, is at Queen & Church. The sharp-eyed will notice that all six of the facing point switches in the new intersection include provision for electrification. The TTC has a large number of manual switches at intersections and the gradual electrification of all of them will be useful both to speed operations during diversions and short turns, and to avoid the operators’ need to manually set and reset switches. Here is another closeup view showing the east-to-north curve crossing the westbound rail. By August 6, enough of the intersection was in place to pour the track in concrete for the main-line Queen Street trackage. This will cure over the next week and service should return on Monday, August 16. With the cooler weather, the tent moved away from the intersection and provided an unusual frame for a view of the new track on Queen east of Parliament. This entry was posted in Dundas Car, King Car, Queen Car, Transit. Bookmark the permalink. ← How Essential is the TTC? Sorry, I couldn’t resist placing this video from Santa Cruz de Tenerife here. Hope this would be helpful in promoting LRT-projects in GTA. Yes, the King Street track replacement has been deferred and will be re-tendered probably February or March of next year with a Construction start in late April or early May 2011. This 4 day replacement of a complete corner in San Francisco (MUNI) is an object lesson of what can be done. Twelve minute stop motion film by a citizen living on the corner. The excavation only goes down to the bottom of the ties, and unlike Toronto, the MUNI does not have to build a new sub-base for the track from scratch. This saves several days. The next time someplace like Howard Park and Ronces needs to be rebuilt, the work will require much less preparation. I note that the layer placed under and around the ties is not concrete, but some other material that is tamped down. This eliminates more concrete pouring and curing. Test cars come and try out the curves when the intersection is assembled, but not concreted in place. There are even gauge bars checking the track after test cars have run over parts of it. This is a Y junction and there is no diamond to be placed in the centre of the intersection as a starting point. The curves are laid with pairs of rails rather than girder-guard rail on the inside curve as in Toronto. The top layer of concrete is poured directly on whatever that intermediate layer is, and service begins shortly afterward. In Toronto, concrete is allowed to cure for several days for strength. There are possibly different structural requirements for these roads in San Francisco based both on expected loads (e.g. trucks) and on temperature swings that are much more moderate. All in all, a fascinating view of a process. That video is great – I really wish someone had done a timelapse of Roncesvalles/Queen. The Church/30th intersection is actually quite simple, especially considering that they only replaced the mainline components. The J-Church route runs between the top and right of the frame. To the left of the frame is a lesser-used and unusual wye that joins three tracks into one. Obviously it is only used for short-turns. (Check it out on Google Maps satellite view.) When I toured San Francisco I ‘involuntarily’ visited this intersection when my Church car dumped us out to turn back downtown. Given how little was changed and that the only concrete was above the ties, it’s odd that it even took them that long to get the job done. I assume the loose ‘ballast’ fill helps reduce the amount of damage to the track caused by earthquakes by absorbing vibration and allowing the earth to slide underneath the structure. 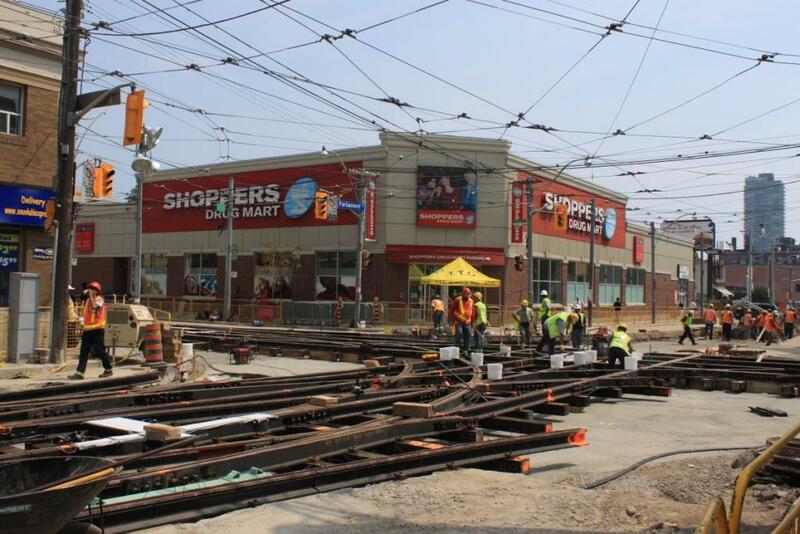 Trackwork on Roncesvalles has official completed. They are now working on the sidewalks on the west side as well as the trolley wire overhead. East side of Roncesvalles will follow. They will be working 2 blocks at a time. Expected completion for this year is December 3, 2010. Tree planting, minor landscaping, and final site restoration and clean up will be done in spring of 2011. Steve: Streetcar service is planned to resume with the December 19 schedules. The TTC has been busily replacing most of their old overhead poles but as usual it is sad to see that on Parliament Street the City and/or the TTC have not bothered to remove all of the redundant poles before pouring new sidewalks. A few of these poles do still have some wires (Hydro?) on them but many are totally “de-wired’ and could, presumably, be easily removed. No doubt at some point they will be removed and new concrete poured but, as Mr Ford would doubtless say, it’s all OUR money. Steve: Toronto Hydro is a force unto itself, and was the source of many problems with the St. Clair project. If Rob Ford can tame them, he would earn the admiration of many people. Instead, he is more likely to try to sell it thereby losing what control the city might have over their operations. Are there workers hired to clear the debris and garbage out of the track grooves on a regular basis? Does this contribute significantly to a streetcar line’s operating costs? And do tracks running through unpaved ROW’s (eg. Queensway, Humber loop) have related/equivalent maintenance problems? Steve: There is a crew that regularly cleans switches to ensure that the mechanism is not blocked by a buildup of dirt and mud (flushed in by rain). The grooves elsewhere are kept clean simply by passing streetcars. This is a cost, but not a big cost of the streetcar system. Talking about track cleaning, there is an old National Film Board film (1953) on a Street-railway Switchman in Winnipeg at you might have seen. I guess mud in switches would no longer be a problem, since our roads are paved. Going back to Roncesvalles, I’ve noticed that the grooves are filled with crushed stone and pebbles along the straight sections (non-switch sections). Does this kind of debris necessarily have to be cleaned out, or as you said, moving streetcars can clear it already? Or can the pebbles interfere with the streetcar wheels? Steve: Mud is still a problem because there’s enough dirt around on streets that it builds up after any rain. As for Ronces, I assume you refer to the as-yet unopened part of the line to Dundas West. This will be cleaned out on a one-time basis prior to running a test car, although this may well be done as a side effect of construction cleanup generally rather than as a “TTC” task. Why isn’t the traditional grooveved track being used anymore? One other place that doesn’t use it anymore is Melbourne, Australia. Steve: Two reasons. It is cheaper to use “T” rail because it is a standard cross-section and weighs less per metre, and with the current track construction methods there is no need to have a section of the rail to keep adjacent pavement from creeping into the groove. You will only see rail with a groove on curves. In the YouTube video linked here recently of the reconstruction of an intersection in San Francisco, it was interesting to note that the curves were laid with pairs of T rails side by side to provide the curve guard function rather than using grooved rail. Looking at the picture of the stop at Garden Avenue above, it appears that bikes will be riding right up and over the streetcar stop platform. Is that correct? Bikes don’t stop for the doors at centre of the street stops. Are they going to stop for doors on a platform? Or will we wait for the first accident of patron being hit by a bike? Steve: Yes, the bikes are intended to ride over the shared space. Cyclists who we all know are the most law-abiding folks on the planet will of course always yield to the pedestrians. This will be an interesting experiment because that layout came from intense lobbying from the cyclists for provision for them in the “new” Roncesvalles. Now we will see if they can behave. I primarily cycle to get around Toronto (using Roncesvalles much of the time since I live close), and even I find these cycle-over bump-outs strange. If there’s a streetcar there, you would have to stop for the passengers, and if there isn’t a streetcar, you could just go around it. There aren’t going to be bike lanes either, so it’s not like the streetcar will be cutting off cyclists. Do you know what the main purpose for these cycle-over bump-outs are? The only reason I can think of is maybe avoiding the track grooves, but that seems less risky then the potential for passenger/cyclist collisions. Steve: Yes, part of the idea was to avoid cycling into the track grooves, but the probability that everyone involved will behave properly is rather low, I think. If streetcar service is restored on December 19, 2010, it will make the first time in several years that the full streetcar network will be in service (largely thanks to the St. Clair construction). Steve: And that magical situation will end again next summer if the Queen’s Quay project actually is launched as planned. But, yes, it is nice to finally have the whole system back after some major shutdowns. The new 199 Rocket is one of the worst service “improvements” ever. Even during rush hour there are only 3 to 5 people on the 199 when it travels between McCowan and Finch to Scarborough Town Centre. People who live east of McCowan practically have no service now. Before the improvements, residents east of McCowan would have to wait anywhere from 3 to 10 minutes for a bus. Now that wait is anywhere between 15 to 45 minutes. So much for “improving” service. It is unacceptable that a 4 to 5 km stretch of a major street such as Finch Avenue East (between Morningside and McCowan) has very little service. The service this stretch of Scarborough receives is often unreliable. Steve: I recommend that you let your Councillor and the TTC know about your observations and complaints. Possibly even the Mayor-elect. Does the TTC have enough running streetcars for all this. It seems that there was always part of one or more route running buses. Steve: The increase in peak vehicles is only 5. Let’s hope they can manage it. 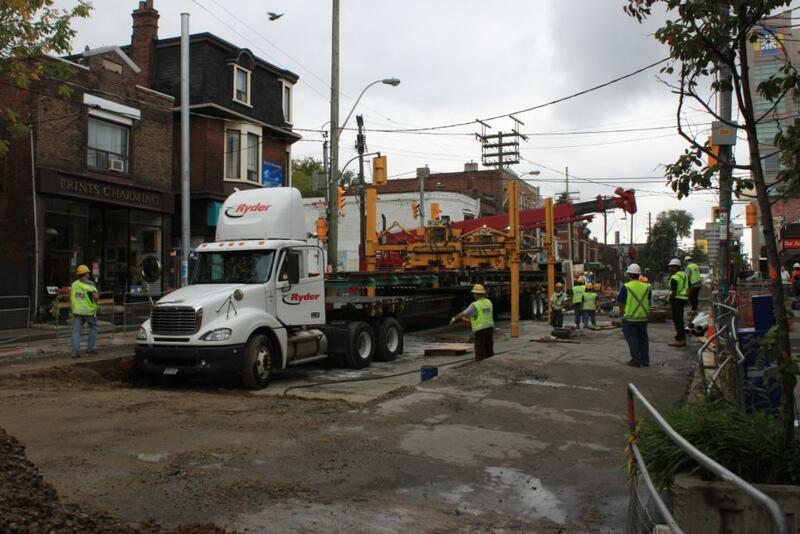 It looks like the City and TTC have blown their opportunity to use the Roncesvalles construction as an example of a project done on time and on budget. 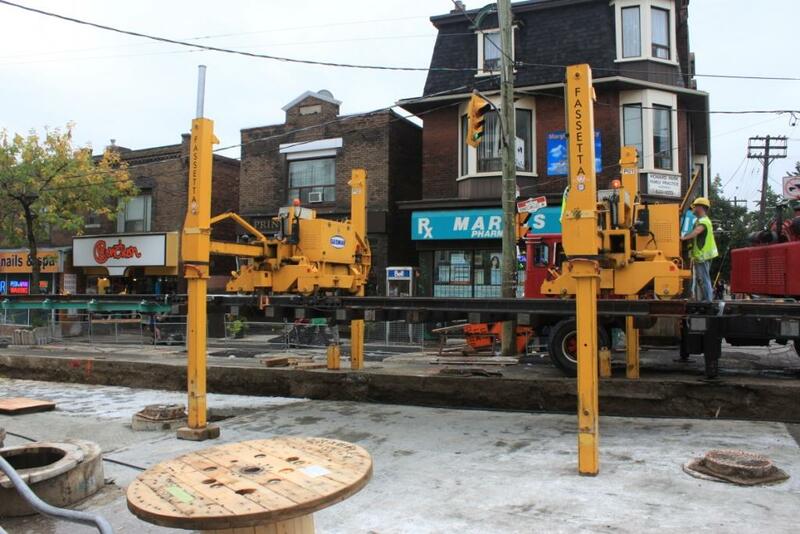 For weeks, Roncy businesses have been demanding to know how it would be possible for the contractor to finish on time when they kept seeing unattended excavators and only a few workers on the street for weeks at a time. The answer is, it isn’t possible. Despite the contractor’s and the City’s promises before the election, they now admit that the project will not be completed by the December 4 deadline, and will continue well into the spring of 2011. Why are the TTC and City so determined to give Rob Ford new ammunition with every reconstruction project? This should have been a good news story, and they screwed it up. Now it will be that much more difficult to persuade communities along Eglinton and Sheppard that the City and TTC know what they are doing. Steve: Actually, the work on Roncesvalles has gone amazingly well considering that it started over three months late thanks to the civic workers’ strike last year that delayed completion of plans and tendering for the contract. The update you linked includes info about Enbridge, and I wouldn’t be surprised to learn that this was one of those “aha” changes that was forced on the city by the utility. Hydro is even worse in failing to properly co-ordinate their requirements. 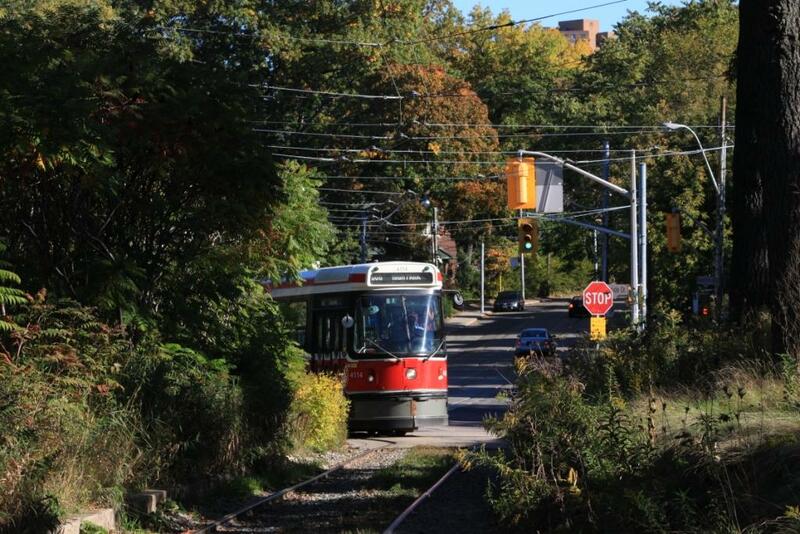 Any comments or concerns following this upcoming Sunday’s return of streetcars to Roncey? I still don’t understand the little ramps that are for bicyclists…. I guess we can sit and watch what happens this weekend. Steve: So much of a new streetscape depends on people understanding how it works, and Toronto is singularly inept at this sort of detail. We can put up a forest of street lights making Spadina visible to other galaxies, but we can’t manage a “no stopping” sign. Had a ride on the 504 King streetcar, up and down on Roncesvalles today. Smooth quick ride, better than the bus. There was a lot more people on the streetcar than when the bus was on Roncesvalles. 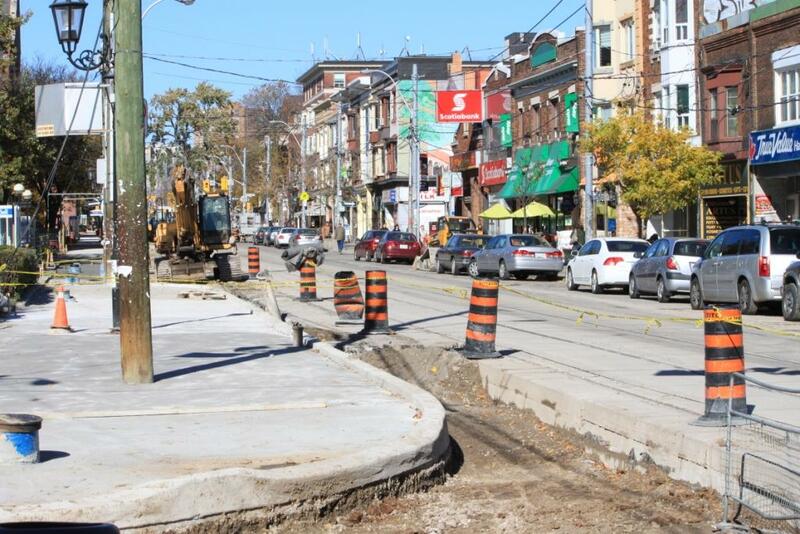 Parts of Roncesvalles have the bumpouts, others are not yet completed, and others have temporary asphalt sidewalks. Some stops are duplicated and the Sunday stops are still there. Hopefully by summer it will be better. 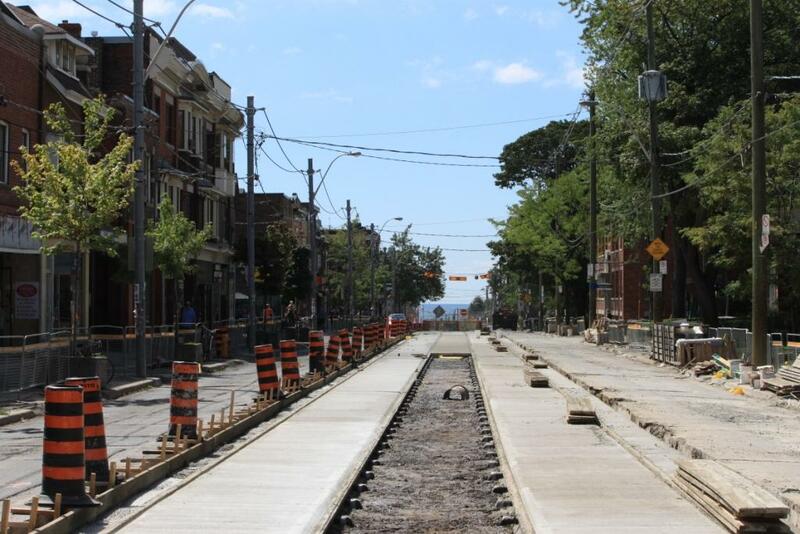 As a resident of the Roncesvalles area, I’m very pleased with the new sidewalks and glad to see the streetcars back. What bothers me is to read articles in the Globe or the Star where local business people describe the neighborhood as a “destination” and worry that the world comes to an end if there is no customer parking. Lots of people live in the neighborhood and walk to shop – -which is why widened sidewalks are absolutely appropriate. Local residents deserve more respect from their own BIA. Steve: On Ronces as on other streets where this sort of construction has happened, there always seems to be two factions: the businesses who understand that they depend on walking trade, and those who want parking for people from afar. On Metro Morning today, the owner who was interviewed talked about how people riding by on the streetcar see his store and will come back later — he gets it. Yes, the bikes are intended to ride over the shared space. Cyclists who we all know are the most law-abiding folks on the planet will of course always yield to the pedestrians. Oh please. There’s nothing inherently dangerous about cyclist-pedestrian interactions. We have them all the time in the city – virtually every park in Toronto allows both cyclists and pedestrians, and people don’t have any problems. Is there something particular about Roncesvalles residents that makes them unable to avoid running into each other? The only reason I can think of is maybe avoiding the track grooves, but that seems less risky then the potential for passenger/cyclist collisions. That’s precisely the reason. Streetcar tracks are very dangerous to cyclists, especially novices, and especially to novices being pushed out into the road by the bump-out. As well, the bump-outs remove the risks in that uncertain moment where a streetcar approaches a stop, pedestrians are walking off the sidewalk to the streetcar in anticipation, but the doors haven’t yet opened and cars/bikes still try to squeeze through. Steve: The problem lies in the design of the stops where it may be unclear to TTC riders and cyclists that part of the space is shared, and the conditions under which either group has the right-of-way. It’s not as straightforward as a park where either one is clearly on a footpath and cyclists had better stay out of the pedestrians’ way, or where one is on a bike path in which case pedestrians are where they shouldn’t be. A “Cyclists Please Yield To Pedestrians” sign? Even though I live in the neighborhood and have been watching the construction since Day One, I only learned the purpose for those ramps just now, reading this post. That’s problem number one: sadly, most residents of the area don’t read your blog. Secondly, the other flaw in the shared bicycle/pedestrian space is that for residents and businesses in those sections, where are they putting their trash cans for pickup? I can tell you that already the cans wind up exactly in that space, either when being put out for collection, or when the garbage trucks deposit them after emptying. And then they sit there for hours until someone puts them away. The fruit stand at the northbound stop at Garden has, for years, staged all of their bins around the streetcar stop pole, and they don’t show up to put them away until the end of the morning rush hour. (In the summer, the stench of the rotting fruit debris and the wasps that attracts makes that stop unpleasant.) You can bet they will be worse once the east side of Roncesvalles gets completed. So I think it’s safe to say that most cyclists will be using the roadway anyway, not those ramp areas. I live at Queen & Roncy and really enjoyed the bus service. Seems there was always one waiting at the Queen & Roncesvalles stop. They have their own police force. Steve: Actually the TTC does not have its own police force. Their security group, formerly but no longer “Special Constables”, does not have powers to enforce city bylaws or Highway Traffic Act infractions. The situation with buses on Ronces is a common problem where the TTC provides vastly better service in some construction areas to soothe the locals’ feelings, and this sets up a “buses are better” comparison. If the 504 was a bus, I guarantee you the service would look a lot more familiar. Just ask the folks on Dufferin or Bathurst about bunching. The exclusive lane bylaw on King. Why is this not enforced? An affordable way to improve downtown service. TTC supposedly runs streetcars every 2-3minutes (rush hour) on that route. I did ask Mayor Miller about this a few years ago. He said something like, “oh, we tried that…it didn’t work”. Maybe its time to try it again. Are not the police force obligated enforce this already on the books bylaw? Is the Bay St. lane being enforced effectively? Steve: The enforcement didn’t work because the police regard this sort of thing as nuisance duty even they were being paid by the TTC to look after it. Also, the exclusive lane covers far too long a stretch of King (Parliament to Dufferin) and is neither credible nor enforceable over its length. There is a more general issue of bylaw enforcement being the exclusive preserve of the police department and the manpower and cost this creates for a non-critical (from a safety and public protection point of view) function. There are on-street parking issues, so perhaps build more parking garages (parking towers?). The cabs at First Candian Place could pull into some parking bays (minor loss to pedestrians).